If you're ready for a finderscope that packs a big deep sky punch, then take a look at the Antares 8 x 50 Illuminated Right Angle Finderscope. With a full 50mm of aperture and a magnification power of 8, you're talking about spotting brighter deep sky objects directly through the finder! Of course, being able to see so much directly through the finderscope also means a little confusion as to precisely where the optics are aimed... But Antares has taken care of that with its adjustable brightness illuminated reticule! Switch on the red crosshairs and center the illuminated box on your navigation stars... Switch it off to pick up the object in the field of view... Turn it on and adjust the brightness level down low and center the object... You're good to go! 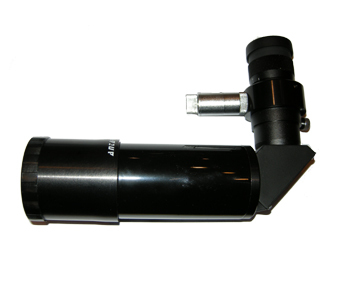 The Antares 8 x 50 Illuminated Right Angle Finderscope speaks for itself with its fully multicoated objective lens, helical focusing, eyepiece with rubber eyeshield, 52º apparent field, internal baffling, dust caps and focusable wire reticule. Aluminum construction means durability and the extra long integral shade helps to prevent dew. If you've got a star chart, you'll find the quality amici prism in the finder's diagonal presents an image correct view to match your maps. All you'll need now is a clear, dark night!